In Part II I introduce a programmatic example on how to deal with the above challenges – An intrapreneurship “Battle School” or innovation competition where participants experience what can best be described as “Reality Learning”. Think of it as a ‘batch-style’, early stage accelerator (I’m sure there are other methods and would welcome hearing form the various readers). Reality Learning (is it real or is it a game? )* was a concept originally introduced (albeit in deceitful, morbid fashion) in Orson Scott Card’s popular “Ender’s Game” book. Ender’s “Battle School” is certainly one of the places where I drew inspiration for introducing a corporate innovation support system, but with a different end goal altogether – not that of creating a demi-god innovator to save my company from the disruption buggers, but a system of collective entrepreneurship. *I’ve called this half real, half simulation school of entrepreneurship Reality Learning vs. Reality Training because it emphasizes that everyone learns, meaning employees, mentors and executive sponsors, vs. training which is often one directional”. During my time at Qualcomm, our innovation team was tasked with designing a completely open, employee involvement program, utilizing the power of an internal social IT network, with a specific focus on finding breakthrough innovation, including generation, selection and experimentation, or the early stage development of ideas. Our team soon realized that great ideas are made, not born, and thus the search for breakthrough innovation would require a higher level of commitment from interested employees working in small teams, akin to entrepreneurial behavior, compared to involvement in suggestion or continuous improvement programs, which can usually be conducted as an individual assignment using spare cycles of work or own time. To design an appropriate breakthrough innovation program, especially one that would encompass experimentation not just thinking and talking, our team first set out to identify the common inhibitors for employees’ entrepreneurial activities within a large company. Our team conducted two major research studies from 2007 through 2009 with academic and corporate benchmarking partners to identify and address the main inhibitors to entrepreneurship at large companies mentioned above. 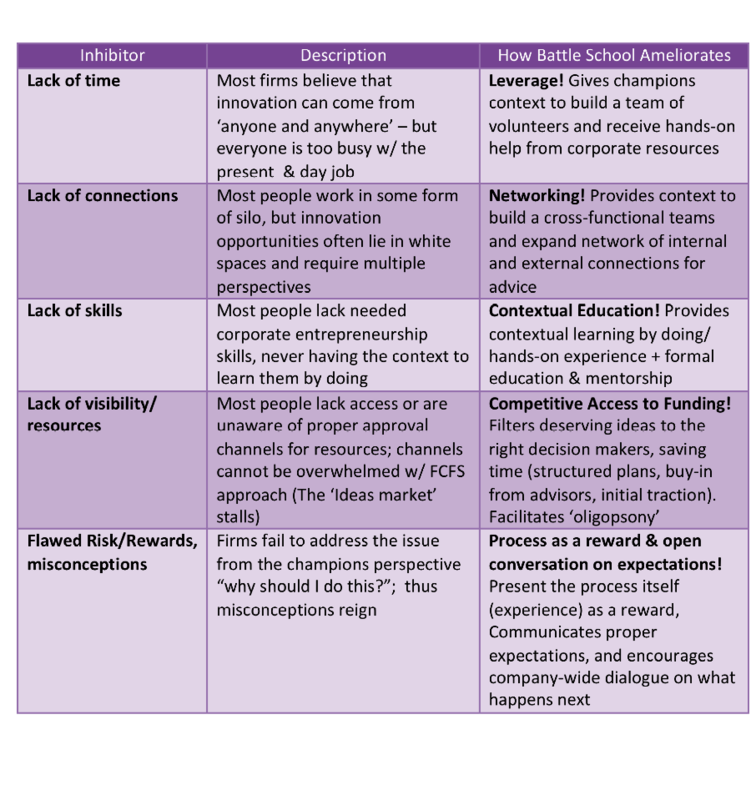 Flawed risk/rewards, misconceptions: First of all, a battle school provides a low-risk training ground for champions to experience the corporate entrepreneurial process before committing themselves to such a formal or de-facto career track (of perpetual entrepreneurial war, which is not for the feint of heart). Second, a battle school is built-in with a rich educational experience, personal recognition, and visibility for the concepts and individuals with ‘real’ chances of something happening to both the ideas and the people behind them. Third, an open battle school encourages the company to reflect on what happens next after opening the bottoms-up innovation floodgate in terms of structural entities needed to incubate ‘real’ opportunities in various innovation horizons, earmarked vs. existing innovation budgets, spin-in vs. spin-out exit strategies and hand-off processes, formal career tracks and compensation/ recognition schemes for champions and enablers/sponsors, etc. Inhibitors to Corporate Entrepreneurship / How an Innovation Battle School Ameliorates Intrapreneurship battle schools (although no one really calls them that) have been formed at several large companies that I’m aware of including Qualcomm, Clorox, Jarden, Merck, Tata, SanDisk and Novozymes. All report various ‘graduates’ (of ideas and people) to active intrapreneurship duty, a marked improvement in innovation skills, attitude and lasting connections, off-the-charts executive and mentor excitement and an overall positive contribution to the company’s risk-taking culture and external image. Hope you get to experience the magic of Reality Learning in your own company soon – now give me 10 pushups!